Sometimes how you present the food to the kids matter. When you place a bunch of roasted veggies in front of them, they may not be inclined to eat it but if you arrange the same vegetables in a different manner, they may gobble up everything. 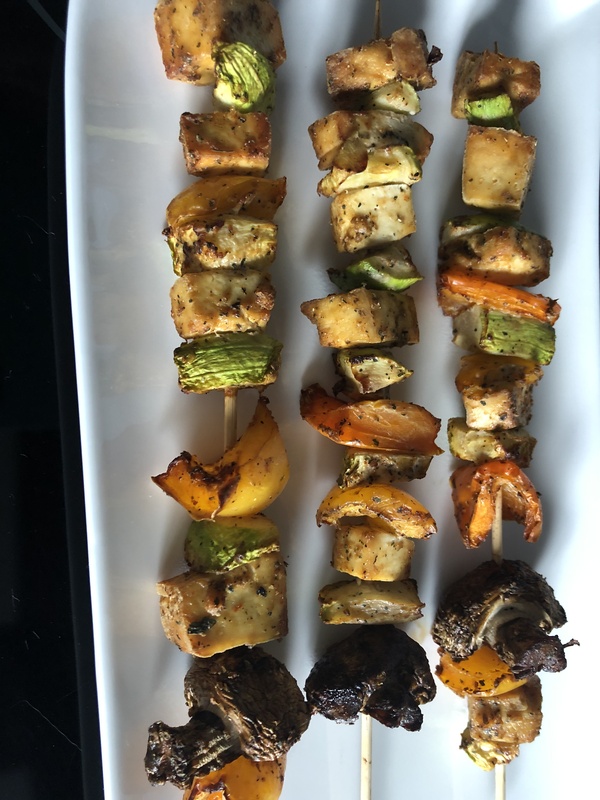 So why not try making vegetable kabobs for your kids today. You can use any vegetables of your choice but we recommended few below. The extra firm tofu gives the texture of barbequed chicken and sometimes the adults are misleaded thinking it is chicken. Cut the peppers, zuchinni, and extra firm tofu into big chunk size pieces. Slice the mushrooms into half. Pour the blended mixture on top of veggies. Mix them well until all the veggies are coated with the marinade. You can either place them in the oven immediately or let the mixture sit for 1 to 2 hrs. Bake for 15 – 20 min depending on your oven. Sometimes I cut the vegetables in bulk during the weekend, marinate them and put them in the fridge immediately. Next day I just take some of them, put them in skewers and roast them in the oven. In this way I have freshly roasted veggies everyday for atleast 3 to 4 days.